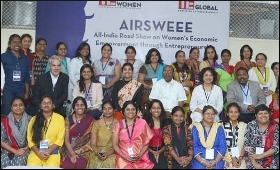 In a bid to uplift women's entrepreneural spirit in the country, the All India Road Show on Women's Economic Empowerment through Entrepreneurship (AIRSWEEE) programme aims to impact around 450 women entrepreneurs across 30 cities, Chairperson Seema Chaturvedi said in New Delhi on Monday. An initiative of not-for-profit organisation TiE Global, the AIRSWEEE programme was launched in September 2016 with the objective of helping develop business and entrepreneurial skills to empower women economically. The California-based TiE Global has created significant economic impact by mentoring 125 women from 27 mostly tier-II and tier-III Indian cities. "The first phase was 125 women, five cities. We had women coming from 27 cities, travelling to those five cities workshops. In our next round, we still have five workshops but we are hoping to get women from 30 cities," Chaturvedi said in an interaction. "We will most probably launch our workshops by February-March of next year and then there will be six months of mentoring," she added. The five cities included Coimbatore (Tamil Nadu), Warangal (Telangana), Jaipur (Rajasthan), Nagpur (Maharashtra) and Durgapur (West Bengal). The AIRSWEE programme was funded by the US Department of State, which is committed to promoting entrepreneurship in India. Chaturvedi, who is also the Managing Director of investment banking and knowledge services firm Accelerator Group LLC, announced the group's commitment to seed the launch of a $25 million early stage private equity fund -- Achieving Women Entrepreneurs (AWE) Fund I -- specially for women-owned and -led enterprises. "The first round of funding from the US state department was for us building capacity for 125 women... The impact of round one was that it led our firm to launch the creation of a $25 million fund. Our fund is the outcome of the impact created by AIRSWEEE," said Chaturvedi. "In the second round of funding, we are going to be more ambitious. We will actually try to reach a total of 450 women, 150 directly by actually mentoring them." In the first phase of the AIRSWEEE programme, TiE Global invited US-based and India-based mentors to train aspiring and early stage women entrepreneurs by conducting skill development workshops in five cities. Twenty-five participants were selected to undergo additional mentoring for a period of six months in the second phase. Chaturvedi added: "We would love to welcome other partners so that it does not just have to be the US state department funding us. We would love for other foundations to jump in and give us funding so that we can grow this programme."